I have always viewed volunteer workers and non-profit organizations – such as (but not limited to) The World Food Programme, Feeding America and Action Against Hunger/Action Contre La Faim – with deep and profound respect. It is a difficult and thankless job. Imagine, for a moment, what it must feel like to see hardship, hunger, poverty and sickness… day in and day out. Yet, these volunteers press on… hoping, no, praying that they are somehow making a difference, making a dent in this world epidemic that is Hunger. Imagine what it must feel like to try to recruit people to help… to contribute their time and yes, their money, to a problem that – like it or not – affects us all. So many people (too many) prefer to turn a blind eye. Until it happens to them. And for those raising their eyebrow: it can happen to them. And to you. And to me. It is never wise to be complacent. As we’ve seen with disasters like Hurricanes Sandy and Katrina, it can happen in a flash. Here today, gone tomorrow. 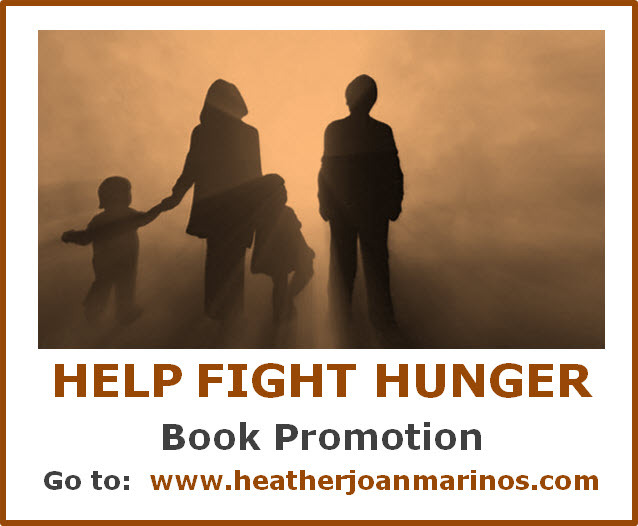 So today marks the last day of my 3½-week Help Fight Hunger book promotion. To say that I am “disappointed” is a huge understatement, but it will not deter me from continuing to contribute my time and writing to helping others, to raise awareness on important issues that ultimately affect us all, and to hope that someone – anyone – will listen and perhaps even join the effort to help those who need our help. I’d like to take a moment to thank the family members, friends, and colleagues who have been kindly “spreading the word” on behalf of my Help Fight Hunger campaign. Most importantly, I’d like to express my deep love and gratitude to my husband for putting up with all the intensity. I hope that I’ve provided you with some informative, thought-provoking blogs on a subject that is discomfiting, but nevertheless very current and critical. Image (t the very top) via erikarachel.com. This entry was posted in Casualties of the Recession/Depression, heatherfromthegrove, inspiration, lessons learned, spirituality, visionaries, philanthropists & sheer brilliance and tagged Action Against Hunger, Action Contre La Faim, Anne Frank, Casualties of the (Recession) Depression, Feeding America, Heather Joan Marinos, heatherfromthegrove, Help Fight Hunger Book Promotion, homelessness, Hunger, Hurricane Katrina, Hurricane Sandy, Joblessnes, non-profit, Non-profit organizations, Philanthropists, Philanthropy, poverty, The World Food Programme, Volunteers. Bookmark the permalink.